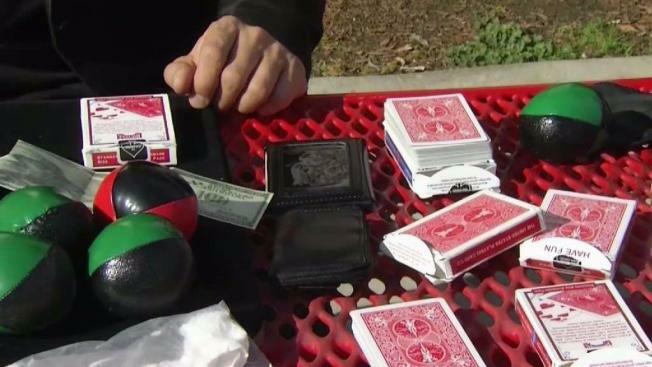 A Bay Area magician is hoping a disappearing act can be reversed. Dan Chan of Fremont parked his car near the Exit Theatre in San Francisco’s Tenderloin a few weeks ago to see one of his fellow magicians perform, and when he returned to his car, he found the window shattered and his bag of unique magic tricks he’d stowed under the seat gone. Chan, who has been performing for homeless people in the Tenderloin, said while everything was worth about $1,000, many items were priceless because of what they meant to him. "Some of these things are very sentimental," he said. "I don’t rely on a lot of gimmicks and gadgets. A lot of these things are ordinary objects or things that I’ve customized or built." San Francisco has seen a spike in car break-ins in recent years. It happened more than 30,000 times last year, or about once every 18 minutes. Chan said for now, he’ll continue his act with what he has and focus on teaching his son the tricks of the trade.